The book is about the marvel art of poetry in its most distinctive form whether it is melodious,intuitive, inventive, foreboding or naturally poring out from the poet's heart. It is a launch pad for a series dedicated solely to the art of creative poetic writing works of poets all over India. It tries to cover the experiences and immortal emotions of life, to the best and in every ideal way possible. 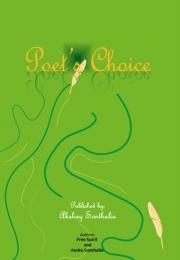 The book had initially compiled poems of more than 10 different poets, however, it was later decided to keep the book author- centric which makes me stand out from the others. This is the first book, and the author himself is the publisher. This series is aimed at digging out the golden skills within the territory of India, and to showcase them to the world, spreading messages of humanity, unity, woe's, sorrows, joys, enlightenment and prosperity. It is dedicated and grateful to all who respect and love the art of poetry. Born and brought up studied from Mumbai, having ventured into poems from 2005, thought of publishing his work in the year 2010. With his enthusiasm to explore new things and circumstances and an ingrained passion for resourcefulness the book is finally printed in 2013. He belongs to a Business family with a history of glory, fame and tragedy. Having spent the greater part of life with friendless circumstances he developed a love for poetry at a very young age. Author dreams to make the book into a phenomenon for creative writers, poets and everyone else.